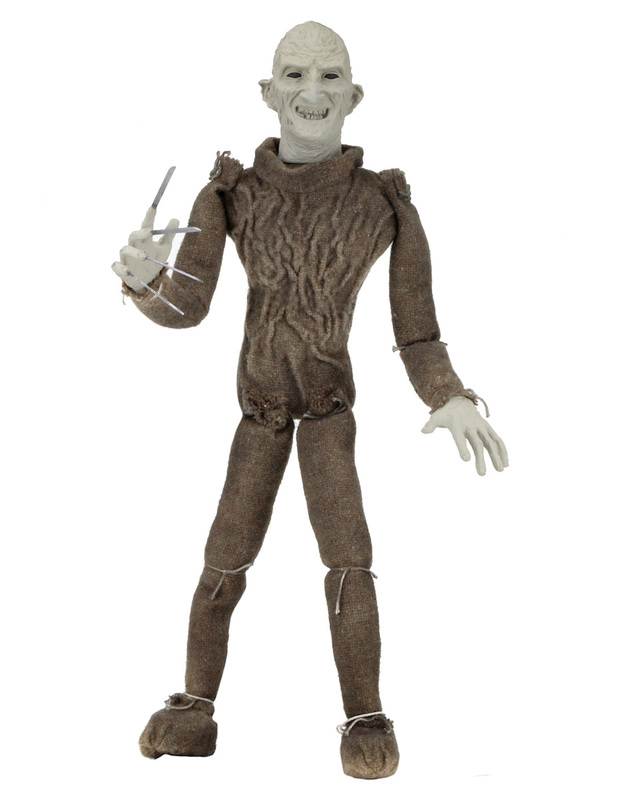 The Horror Movie BBQ: BUY ME TOYS! 7 Things I Want From Toyfair 2017! Toyfair is that time of year where toy collector starts drooling. Sadly, they also hear their wallets crying and whimpering at how much they'll likely be spending on plastic crack throughout the year.It is rather upsetting but hey, man...gotta get those Batman toys! For those who may not know, Toyfair is the annual event where all major toy companies show off their goods for the year. It's been a long standing tradition for me, since about 1998 when I would get Toyfare, to make a little checklist of stuff I wanted. Obviously, there's always a toy or two that doesn't get released for one reason or another but for the most part, these toys get released and gobbled up by collectors everywhere. It's a nice time and a great way to start off the year! 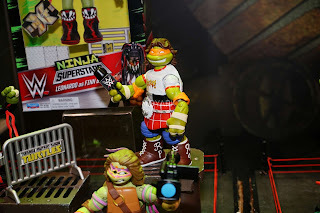 But what caught my eye at Toyfair this year? Let's take a gander! 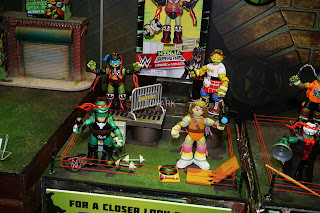 The TMNT/WWE mashups have been extremely popular amongst fans and kids of all ages. Collectors have been grabbing these up, despite their rather hefty $20 price tag. This kind of creativity brought out the kid in the older generation and gave the younger generation a fun new way to play with their Turtles. The entire collection is fantastic, but since Roddy is one of my all time favorite wrestlers and heroes, I have to have to him specifically on my shelf. And of course, Mikey is my favorite Turtle, as if you'd be surprised. Best of both worlds? You bet! 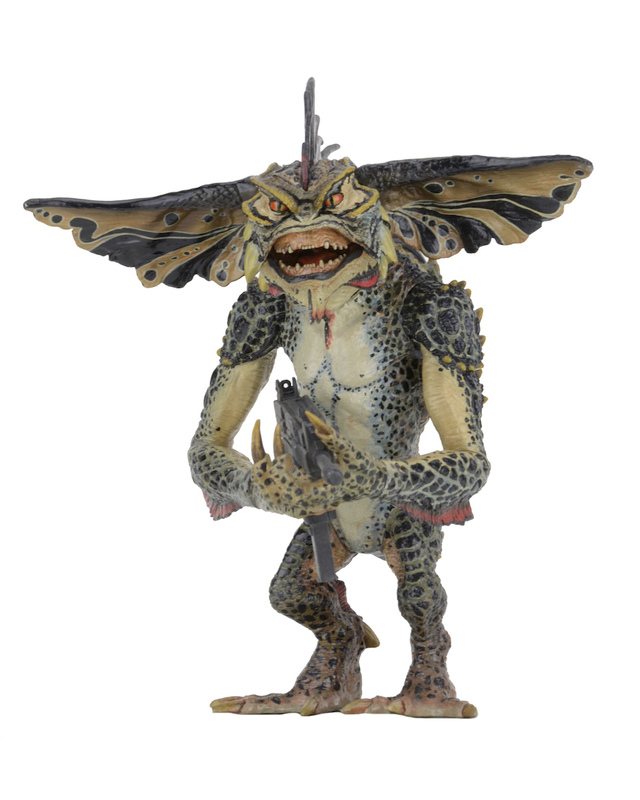 It's kinda hard to get something new out of an old property like Gremlins 2. Most of it all has been done, with the exception of say a Calmp figure. And not giving us a John Glover figure may be the biggest crime in the world. But until then, I gladly accept this Mowhawk figure with a machine in in it's place. The paint job, the sculpt, the fact that it's going to have a hinged jaw, makes it a nice take on a classic character. If you weren't around for the Death of Superman, it's absolutely impossible to describe the impact of what this story meant to fans and the comic book industry. It was absolutely massive. How could it not? SUPERMAN WAS DEAD. Well, sort of. Spoilers. D'oh. This set by DC Collectibles is the perfect depiction of that last stand between Superman and Doomsday. In fact, the second it popped up in my feed, I thought it was a statue. I may be more excited for this than anything else. The showstopper is right here. When NECA presented a fantastic Clark figure last year, I have to guess a LOT of fans were either removing the hockey mask from their Jason to recreate the famous homage scene. But now we're getting not just Clark with the mask BUT THE CHAINSAW TOO! it had Chevy in a Christmas Hat. Someone make that happen. That would be awesome. I've always been a fan of The Warlord. He's just such an awesome and imposing guy and had a great look. Sadly, his "crazy space gladiator" only got one figure(which I reviewed here). 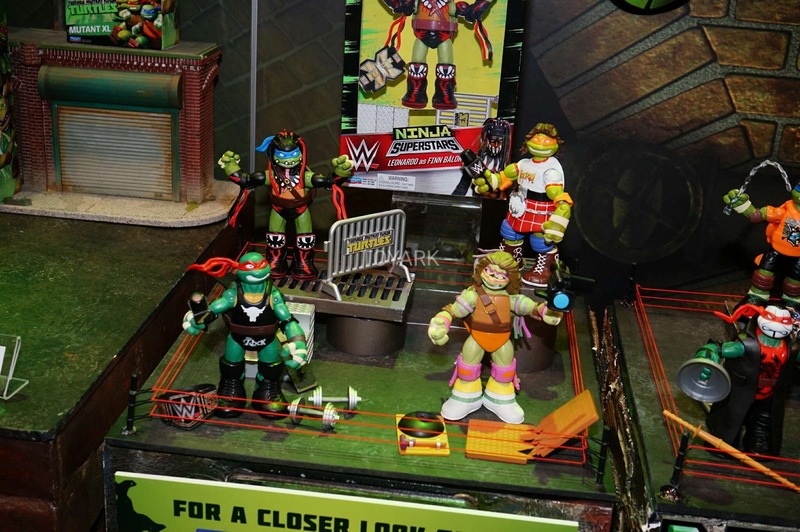 Jakks released a very low rent version but offered nothing in the accessory range to make it stand out. I'm so embarrassed and angered by it, I'm don't even want to post a photo of it. 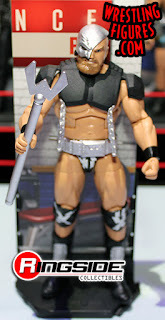 Thankfully, Mattel is giving us the Warlord we all have hoped for. That is one of the most impressive figures I've seen by Mattel in some time. It just looks like it's ready to shoot laserbeams out of his eyes and break your back. This is the figure I've been waiting so long for and I will happily buy as many as I can. Why? 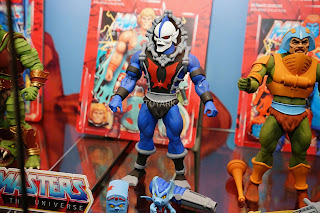 Well, I kinda wanna make him some sort of stormtrooper for that Hordak I just wrote about. And doesn't the Warlord look like he belongs in the MOTU universe? This sculpt was what we would've gotten. But considering the sculpt on this beauty, I'd say it's worth the wait. All 18 inches of him. For Freddy collectors, this has been a long time coming and very welcome addition to any Fred-Heads collection. Myself included. Once again, thanks to the great folks at ToyArk.com for their amazing coverage as well as allowing me to use their photos. 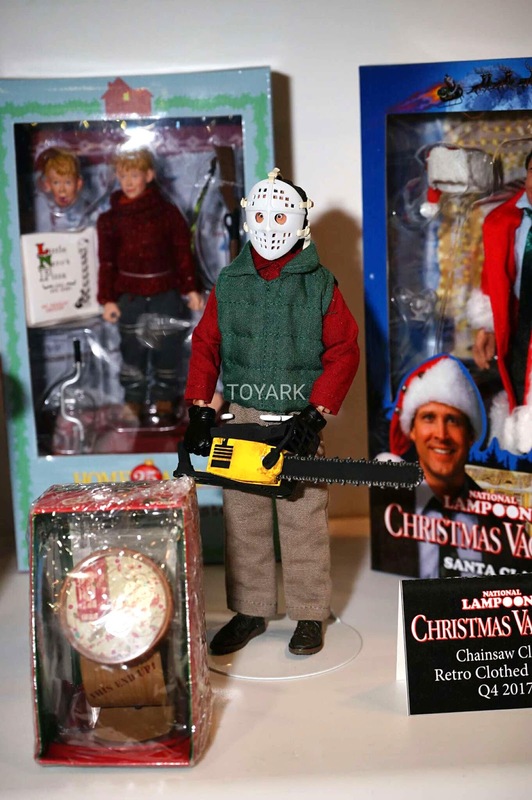 Please visit their site for the BEST toy coverage out there! 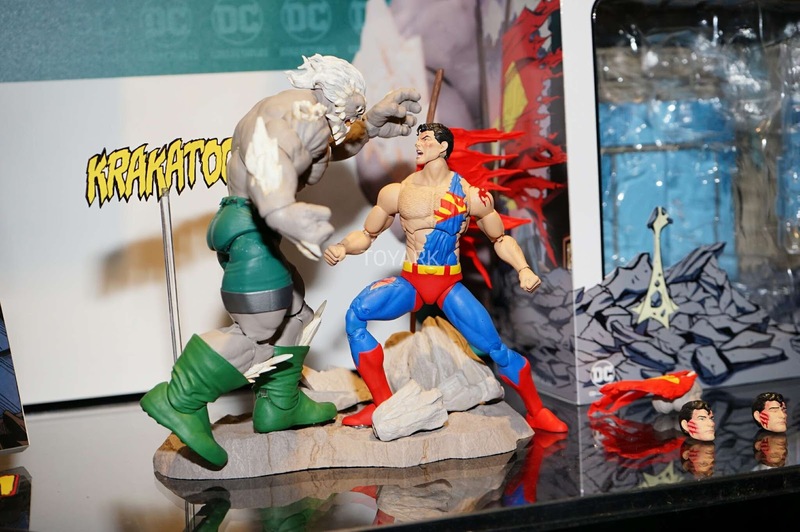 Whoa, I'm loving that Superman/Doomsday set. I almost wish Superman looked a little worse for wear, but it's not that big a deal. They look awesome. Totally missed that Clark with the hockey mask! WANT!!! You need to partake in a radical new challenges worried among the finest data destinations on the web. I'll propose this unique site! Likewise, watch movies online the quality of DVD you play at home may or may not be up to the mark. Interestingly, the freedom to watch movies online without paying single penny sets you free from adopting the first two options. But whether this method is safe or not, let us find out.